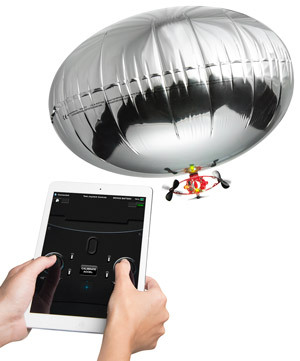 Bluetooth Micro Blimp: Turn a balloon into a phone-operated blimp. The Bluetooth Micro Blimp transforms an ordinary balloon into a fully controllable airship that you pilot with your smartphone or iPad. Your balloon dirigible will be powered by three propellers on a small gondola. 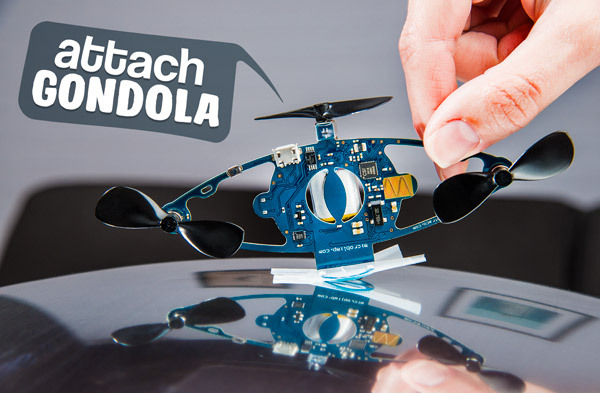 The gondola attaches to the included mylar balloon with scotch tape and connects to your device via bluetooth. Use the free app to control the gondola’s motors with twin virtual joysticks that allow you to maneuver around the room with ease. 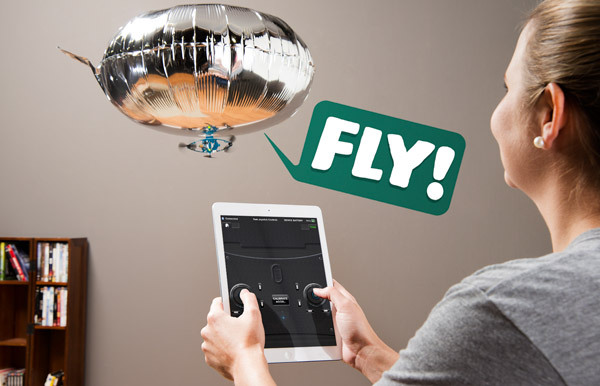 With a little helium and some practice, you’ll be able to steer your craft like you’re flying over a football stadium. Blimps don’t just have to be for sporting events and retro-future visions of the city's morning commute. 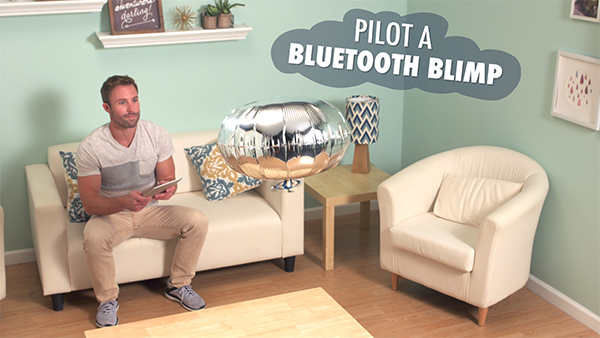 The Bluetooth Micro Blimp kit lets you make and pilot your own blimp right in your living room. 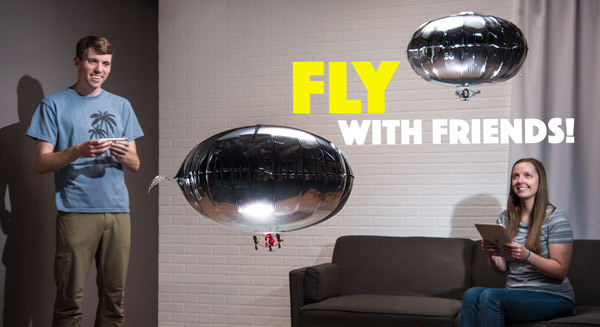 Instead of buying an entire RC ship with a controller, the Micro Blimp transforms an ordinary balloon into a propeller-powered aircraft you can fly with your phone. The clever design makes it easy to get your craft in the air where it belongs. In this case, you can drive and be on your phone at the same time. Getting your Bluetooth Micro Blimp off the ground doesn’t require you to log flight hours or undergo an advanced build; all you need is a little scotch tape and helium. 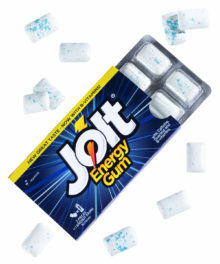 To get started, fill the included mylar with helium through the one-way valve and attach the gondola using scotch tape. The kit includes washers and magnets as ballast to help the balloon achieve neutral buoyancy (where it neither sinks nor ascends). Once you attach the washers using scotch tape, adhere as many magnets as you need in order to stabilize your airship. Once it’s neutral, you’re ready to start flying! The process is quick enough that you won’t hesitate to replicate it whenever you feel like taking her up for a ride. Next destination: the Super Bowl. The gondola has three propellers: two on the side and one on the bottom, allowing for maximum maneuverability in the air. 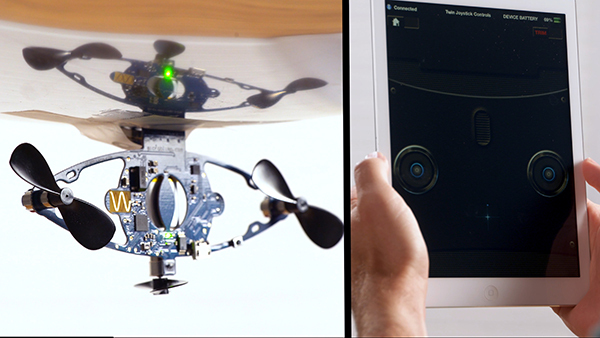 The gondola pairs with your smart device to control those propellers as you pilot your craft. When your craft is running out of juice, give it a charge with a Micro-USB B cord to get back in the air. Controlling that gondola is easy with the free iOS Micro Blimp app. The controls simulate a dual joystick controller, using your touchscreen to manipulate each joystick. There are two control modes (Tank and Twin Joystick) that are both customizable to fit your piloting preferences. The app also includes a startup guide so you can get started right away. Blimpin’ ain't easy (except with these controls!). Once you have your Micro Blimp up and running, it’s up to you to decide how you want to have fun with it. Master your controls and test your precision piloting by setting up an obstacle course. Or have friends bring over their blimps for a good old-fashioned blimp race. 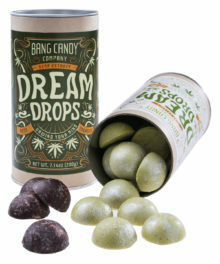 Bluetooth technology allows you to have multiple blimps in the same room without losing control over your craft. The Bluetooth Micro Blimp gondola comes in red, blue, or white. 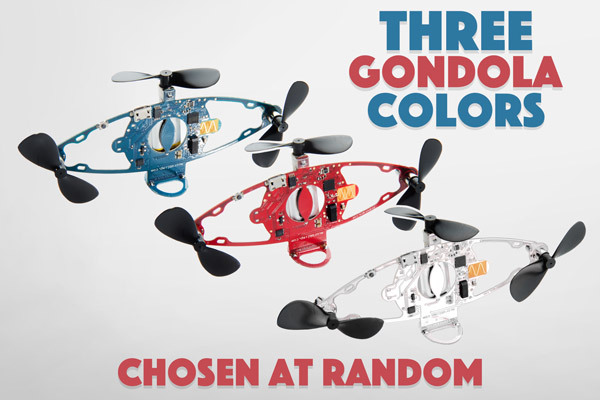 The color you receive will be chosen randomly, but all three colors are equally adept at creating hours of flying fun. Question: If the balloon pops, do I have to buy a whole new set? 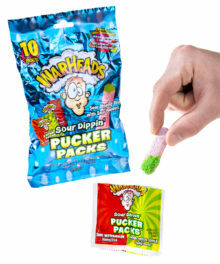 Answer: The gondola included with the Bluetooth Micro Blimp kit should work with any similarly sized mylar balloon. Question: How do I inflate the balloon? 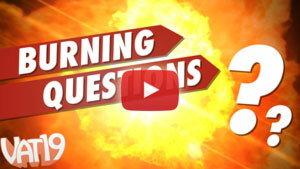 Answer: You’ll need to supply your own helium to inflate the included balloon. 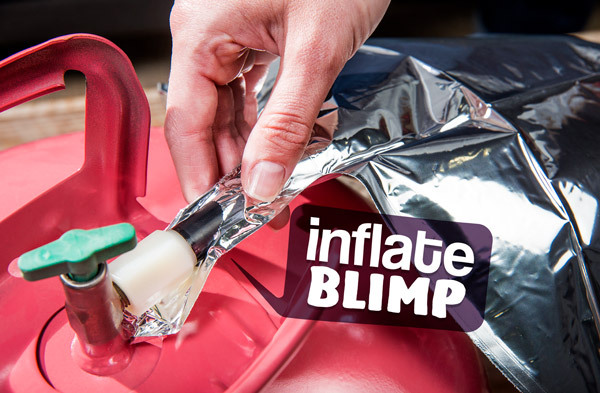 If it’s been several days since your last flight, you can use the balloon’s one-way valve to top off the balloon with more helium. Question: What if I lose those tiny washers and magnets? Answer: The washers and magnets included with the Bluetooth Micro Blimp kit are used as ballasts to achieve neutral buoyancy. Any small object (such as coins) will work in their place. Question: How do I charge my gondola? Answer: The gondola charges with a Micro-USB B cord (which you’ll need to supply yourself). Please note that this is a common cord that you may already have for your other electronic devices. Sorry! 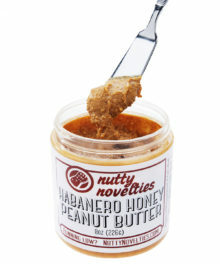 We're sold out until May 01. More stock arriving on May 01, 2019.